WASHINGTON, D.C. (CNN) – President Trump, signaled he will sign a bi-partisan deal to keep the government open. 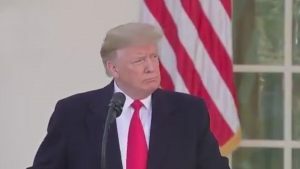 Despite not liking it, Trump stated, “I appreciate all the work the Republicans have done because they’re really going against a radical left. The agreement includes $1.375 billion for a border barrier—lower than the $5.7 billion President Trump originally demanded for the wall and even lower than the $1.6 billion included in the Senate proposal rejected by the president in December. But Republicans are urging the president to sign off anyway. The White House is not making any promises on behalf of President Trump. White House Press Secretary Sarah Sanders said, “We want to see what the final piece of legislation looks like. It’s hard to say definitively whether or not the president’s going to sign it until we know everything that’s in it. Aides said the president is continuing to weigh his options to fund the border wall outside of Congress, including taking executive action.